WORTHING Raiders Rugby Club continued their winning streak with a 20-12 victory at Canterbury on Saturday. Raiders led 13-0, before Canterbury fought back to bring the score back to 13-12 but a late converted try sealed the visitors’ win. After three successive wins before Christmas, Raiders captain Rob Smith was delighted to continue their winning run and said: “It was a positive start to the new year and it was good to continue our momentum. “We started the game really well but then eased off a bit, which gave them a sniff. Worthing, who remain sixth in the table, are now just 12 points behind second-placed Dorking, who lost 6-5 at home to fifth-placed Chinnor on Saturday. 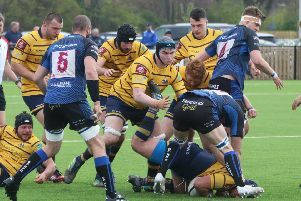 Raiders entertain Chinnor at Roundstone Lane on Saturday, with a 2pm start, and Smith said: “With Chinnor beating Dorking, it makes this game even bigger than it already was.